All Amador City homes currently listed for sale in Amador City as of 04/25/2019 are shown below. You can change the search criteria at any time by pressing the 'Change Search' button below. "ONLINE AUCTION for TWO TURNKEY, FULLY-FURNISHED HOMES which includes a meticulously-restored 130-year-old church and a modern guest house on 1.7 acres of beautifully-manicured grounds. Nestled in the heart of the Shenandoah Valley wine country, this is the ultimate wine country retreat, perfect for secluded getaways or hosting fabulous parties. The Shenandoah Valley is one of California's most precious hidden gems, boasting 45+ award-winning wineries. 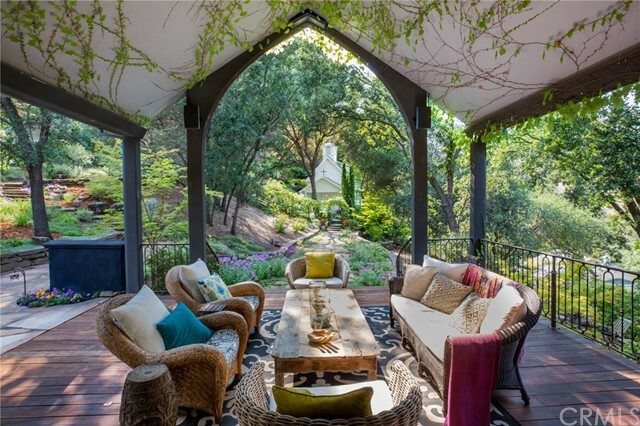 The rear home is an enchanting, historic church, lovingly restored into a beautiful home and is acclaimed as the most dazzling and unique residence in the county. The front house offers a more modern feel with an eclectic assortment of world-class antiques. The main floor features a large entertaining area with kitchen, bathroom and studio space. The owners have hosted several glamorous events with up to 300 people on the property. Between and surrounding the two homes is a garden paradise masterfully blending raw natural beauty, rich architecture, and antique charm, offering a one-of-a-kind property. CURRENTLY ACCEPTING POST-AUCTION OFFERS."